After looking at scores of can openers, we decided that the OXO 1049953 Stainless Steel Can Opener, Smooth Edge, should take first place as the best manual can opener because of its all-around high-quality design. Its stainless steel construction makes it incredibly sturdy. Engineered with safety in mind, it leaves a smooth edge on cans and lids-no worries about cutting your fingers as you remove the can from the opener. The knob is easy to turn, and the handles provide plenty of traction for your hands. The blade doesn’t come into contact with your food, and you can even remove the lid without touching it. A good can opener can be hard to find, especially if you’re not sure what to look for. Most manual can openers cost much less than other items you use in the kitchen, such as a blender or coffee-maker, so it’s easy to buy the first one you find without giving it much thought. Plus, if we’re to be honest, can opener shopping is not the most exciting undertaking. However, doing a little research and buying a top rated can opener can save you a lot of time and trouble in the long run. If you’re like most people though, you may not have a lot of extra hours in the day to comparison-shop for a can opener. We’ve done the research, so you don’t have to. Manual can openers offer a low-cost, low-tech addition to your meal-prep toolkit. Although their design is relatively straightforward, there is an impressive variety of manual can openers on the market, and no two types are created exactly the same. Automatic (electric or battery-powered) can openers may be easy to use, but they have their drawbacks. You either need to have back-up batteries on hand consistently or ready access to a power source. 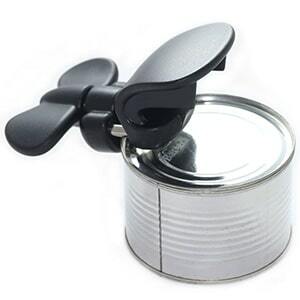 Automatic can openers are not the most convenient option, for instance, on a camping trip or during a power outage. On the other hand, they usually require less effort to operate than manual types, since you can activate them with the touch of a button. 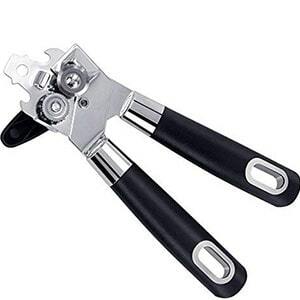 Most of the best manual can openers are equipped with stainless steel blades, which are durable and resist rust. Other materials are more susceptible to warping, breaking, and tarnishing. A manual can opener should fit easily into a drawer. If storage space in your kitchen is limited, look for a device that mounts on the wall. The best can openers come with all the hardware you need for installation already included in the packaging, and they don’t take long to assemble. As is the case for the blade, the rest of the can opener should be made of sturdy materials, and the whole thing should be easy to clean. The latter consideration is especially important if the opener’s blades come into contact with food, and will therefore require washing after use. Blades that don’t touch the food rarely get dirty, so you probably won’t have to do much more than wipe them down on occasion. Many top-cutting can openers are meant for hand-washing only, so if you want to keep clean-up to a minimum, consider the side-cutting option. Additionally, the higher-quality can openers balance well on countertops. Consider how much you’re willing to spend. Some high-quality can openers come at a very modest price, while other similarly-priced items are of considerably lesser quality. Some of the more expensive types are well-worth the investment. It’s important to do your research ahead of time to compare prices and reviews and decide which features are most important to you. Handles should be comfortable and easy to grasp. It’s a bonus when they don’t require too much squeezing and give you enough traction that your hands aren’t likely to slip off in the midst of a cut. Can openers with sturdy handles and large knobs are especially handy for people who suffer with pain in their hands or have issues with grip strength. A good can opener should perform consistently well for a long time. The best manual can openers provide a smooth, fluid cut on the first attempt. Don’t settle for one that skips or stops halfway around the can. 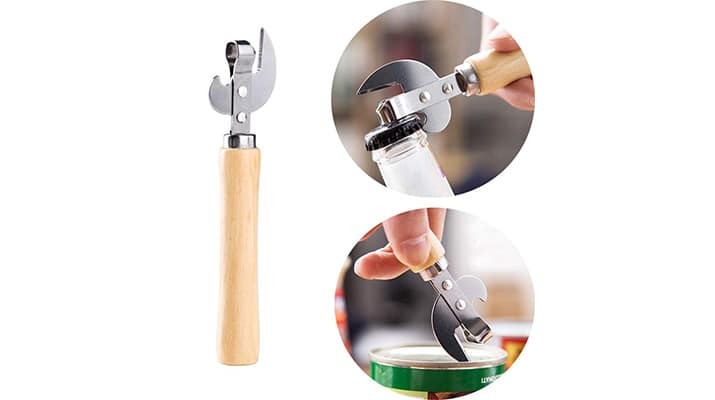 A well-designed can opener leaves smooth edges on lids and cans, eliminating the risk of cutting yourself when handling the can once the top has been removed. Some can openers also come with safety features that minimize the likelihood that your hand will touch the blade. Many can opener-related injuries occur when the user’s hands slip off the device. Handles that are easy to grip make this mishap less likely to occur. Some people prefer a device in which the blade doesn’t touch the food. Similarly, many customers prefer side-cutting openers or top-cutters that have a magnet to hold the lid in place. Otherwise, it can fall into the food, which isn’t very sanitary if the lid is dusty or you have to use your fingers to remove it. People who like to use the lid to drain the can often prefer the top-cutting openers because they can remove the lid for this purpose. On the other hand, since the side-cutting tools don’t remove the lid, they allow you to continue to store the food in the can temporarily-for instance, if you want to keep it covered for a while as you cook. The best manual can openers can handle a variety of can types and sizes. Some even double as bottle or jar openers. 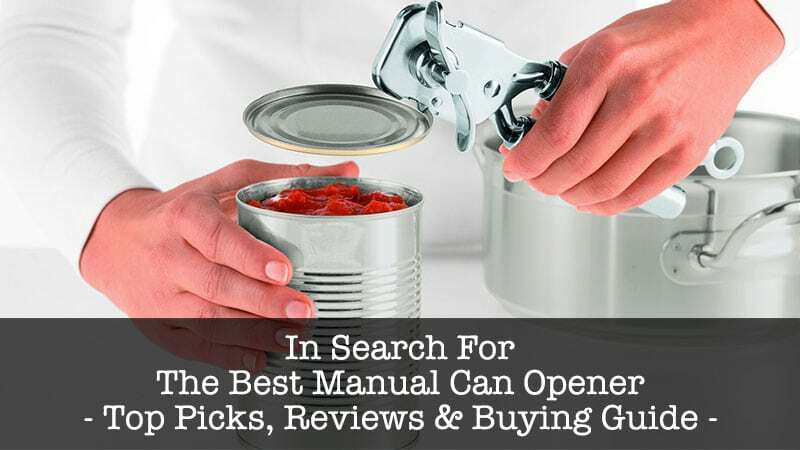 To find the best manual can opener, we looked at hundreds of reviews from buyers who included amateur chefs and culinary connoisseurs. We checked out ratings and comments from customers who provided valuable feedback about the pros and cons of each item. Why You’ll Love It: We selected the OXO 1049953, Stainless Steel Smooth Edge as the best manual can opener because of its sturdy, stainless steel design and ease-of-use. Its patented side-wind mechanism cuts almost effortlessly and leaves smooth edges on the can and lid. Equipped with non-slip handles and an easy-to-turn knob, it doesn’t do a number on your hands like some can openers. Since it cuts on the side of the can below the edge, the blade doesn’t come into contact with the contents, so it stays cleaner, longer. Lid pliers allow you to seamlessly remove the lid; no digging it out of the can with your fingers or a utensil. You can easily open cans of all sizes. Pros: It’s relatively easy to clean, opens a variety of can types, and cuts from the side so it doesn’t touch the food. Customers note that it doesn’t require your hands to work overtime. Cons:Reviewers were disappointed that not all the care instructions were included in the owner’s manual. Inside the packaging, they found a recommendation that this item not be placed in the dishwasher. Because it requires hand-washing, it can be a little higher-maintenance than dishwasher-safe varieties. Some people reported having a bit of difficulty lining up the can with the blade to start the opening process, especially with smaller cans. People who are used to using more “conventional” can openers may find this one a little tricky to use. Carefully follow the instructions in the manual, and using it will become second-nature. Why You’ll Love It: If you’ve ever purchased a low-cost manual can opener before, you know that they don’t always deliver the quality you expect, leaving jagged edges on cans and lids and turning with great difficulty. 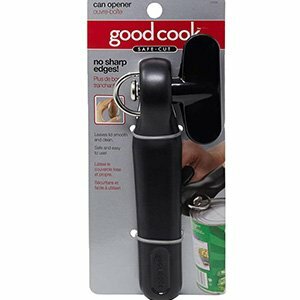 The Good Cook Safe Cut Manual Can Opener stands out from most conventional budget can openers. It features a patented design that leaves no sharp edges after slicing open cans. Its gear-driven blade is rust-resistant, always a plus when you’re handling anything related to food-prep. The non-slip plastic knob turns with virtually no effort. Its long, ergonomic handle is easy to grasp, so it doesn’t give your hands a workout. The cutting wheel never touches food, making this device a more hygienic option than most top-cutting openers. Some budget can openers are thin and flimsy, but this one is sturdy and durable. The whole thing is designed to resist warping, breaking, tarnishing, and staining. And it’s dishwasher-safe, but since the blade doesn’t touch the food, it doesn’t get very dirty anyway. Pros:This best manual can opener on a budget is built to last, easy to use, and leaves smooth edges, so you won’t risk cutting your hands when opening cans or removing them from the blade once cutting is complete. This best manual can opener on a budget is built to last, easy to use, and leaves smooth edges, so you won’t risk cutting your hands when opening cans or removing them from the blade once cutting is complete. Weighing in at 4 ounces, it’s lightweight but still heavy-duty. Another plus: It’s easy to clean. Cons: Some customers reported that the can opener became less effective over time and didn’t last as long as they expected. 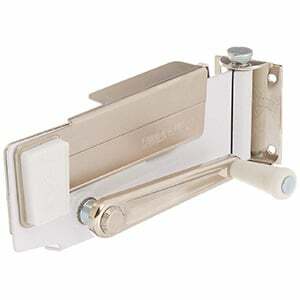 Why You’ll Love It: The Swing-A-Way Wall Mount Can Opener with Magnet features durable steel construction, so it can power through a variety of can types, even those that may be tougher to open with most other can openers. You can lock it in three different positions when it’s not in use, allowing for safe, easy storage. Since it mounts conveniently to the wall (the brackets and screws are included in the packaging), it won’t take up precious countertop, cabinet, or “gadget” drawer space. This keeps it in easy reach while you’re cooking, too. The high-carbon cutting wheel easily makes its way across the tops of cans for nearly effortless cutting. An integrated magnet helps you lift off the lid so you don’t risk cutting your hand on it. Did we mention it comes with a built-in bottle-opener, too? Pros: It’s easy to install, and it folds up, so when you’re not using it, it doesn’t get in your way and doesn’t take up counter or drawer space. To clean it, all you have to do is take it down from the hinge pin and wash it. It opens virtually all types of cans. Cons: It can sometimes be difficult to successfully open cans completely on the first attempt. Some customers said it wasn’t as sturdy as they expected. Why You’ll Love It: Looking for the best manual can opener that doesn’t require both hands to operate? 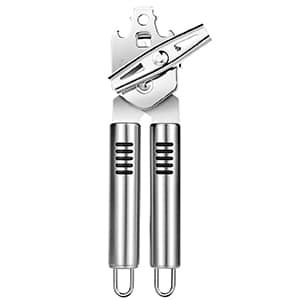 Look no further than the Bartelli Soft-Edge 3-In-1 Ambidextrous Safety Can Opener. This handy device triples as a can opener, bottle-opener, and jar opener. Its innovative design doesn’t require squeezing the handle to open cans, so it doesn’t put your hand strength to the test. The blade locks automatically onto the side of the can and doesn’t leave sharp edges on it or the lid and allows you to keep food covered while you cook because the can remains sealed until you take the top off. The blade never touches the food, so there’s minimal clean-up involved. The single handle that powers the knob is easy to operate. It’s lightweight, too. Pros: This 3-in-1 tool helps you minimize “gadget drawer” clutter. It’s easy to use, especially for people with arthritis or limited use of their hands. Since it doesn’t leave sharp edges, it’s good for kids to use. It easily opens cans of all types. Since the cutting mechanism doesn’t touch the food, it doesn’t require a lot of cleaning. Cons: The short knob doesn’t provide a lot of torque, and it can be a bit awkward to use if you’re left-handed because you have to turn it in the same direction as you would an opener designed for right-handed people, unless you spin it backwards. Some customers report that in the beginning, it’s a bit difficult to use, but once you get the hang of it, it’s pretty easy. Why You’ll Love It: KitchenAid is a well-known brand, and like others bearing that label, this can opener delivers what is promised. 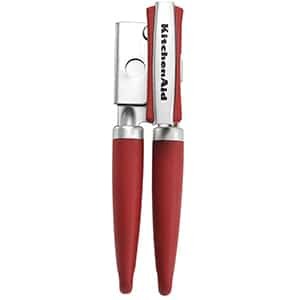 The KitchenAid Gourmet Soft Grip Can Opener with Magnet is our top pick in this category. The stainless steel blade can get through just about any type of can. Ergonomic handles help you keep a steady grip on the can opener so it doesn’t slip or slide. This manual can opener’s size and weight give it good balance. With flimsier manual can openers, the cutting mechanism can be difficult to clean thoroughly because of its size or the way it’s positioned, but with this one, the oversized knob is designed for easy turning, and the magnetic lid remover keeps the lid in place when the can has been opened. Clean-up is relatively easy too. Just wash with a mild detergent, rinse, and dry thoroughly. All across the board, this device got high ratings in terms of ease-of-cleaning, ease-of-use, and durability. Pros: The can opener has a sturdy design and cuts easily- ‘like butter,” according to some users. The magnet keeps the lid from falling into your food so you don’t have to dig it out with your fingers or a utensil. It doesn’t require too much effort to squeeze the handle and turn the knob. Customers were pleased with how easy the knob is to clean. Cons: Some people found this model to be a bit larger and heavier than some conventional can openers. Why You’ll Love It: If you share your household with children or elderly people, or have just had too many bad experiences slicing your fingers on poorly-constructed can openers or sharp can edges, you’re no doubt looking for something that reduces the risk of injuries. We recommend the Can Opener Manual with Soft Grips Handle. This best manual can opener in terms of safety has a lot to offer. 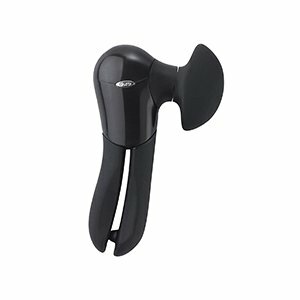 Its durable, ergonomic design features a strong handle connected to a large, non-slip knob. The serrated cutting wheel is equipped with a safety mechanism to ensure that it only cuts cans, and not hands. This easy-to-use can opener effectively tackles a variety of can types and sizes, and even bottle caps and tough plastic jar seals. If you’re concerned about the potential for cross-contamination when cooking, you’ll be happy to know that the blades on this can opener never touch the can’s contents. To clean the blade, just rinse it in the sink or throw it in the dishwasher. Pros: It leaves smooth edges on cans and lids. Rubber on the handles allows for a non-slip grip. It doesn’t require much effort to turn. It’s low-maintenance, since it doesn’t need much cleaning. It effectively opens a variety of cans, bottles, and jars- everything from soups to wine to pet food. Cons: One user reported that the turning knob looks like a cutting wheel, so there may be a little confusion at first as to how to line up the can. Other than that, it was difficult to come up with any shortcomings in this can opener. What You’ll Love: If you want a durable, top-cutting tool that doesn’t touch the food, consider the Rosle Stainless Steel Can Opener with Pliers Grip. Although it doesn’t cut from the side, the sealed cutting mechanism is designed not to touch the food, so clean-up is hassle-free. The ergonomically-shaped thumb screw turns easily. You don’t have to worry about cutting your fingers on jagged edges, and this tool cuts so that you can continue to use the lid for short-term storage. If you’re popping open a can of something especially sticky, like condensed milk, integrated pliers make it easier to peel off the lid. Pros: It’s sturdy and durable, and you can open a can and remove the lid without ever having to touch the contents. It’s easy to use– a plus for people with arthritic hands. It quickly glides through different types and sizes of cans. Requiring little in the way of cleaning, it’s low-maintenance. Cons: This can opener doesn’t work like most traditional ones (it clamps the lid from the top rather than the side), but once you get used to that, operating it shouldn’t be a problem. Some people reported difficulty opening certain types of cans, such as those with an especially deep rim. The price is a little higher than some can openers, but most customers who commented on the price felt like they got their money’s worth because the can opener is so sturdy and easy to use. Why You’ll Love It: If you’re looking for something a little more versatile, try the Premium Stainless Steel Manual Can Opener by Fairsoph. 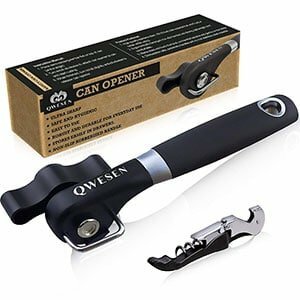 This heavy-duty tool cuts cans with a sharp stainless steel blade that opens standard-size cans and beer bottles. Its side-cutting system leaves a smooth edge and doesn’t come into contact with the food. With a high-carbon, gear-driven cutting wheel and skip-proof feed, it allows for smooth cutting. Unlike some can openers, with this one, you don’t have to worry about cans slipping off in the middle of the cut. The device stays well-balanced. Since the blade cuts high into the can, you’re less likely to deal with spilling or splashing. Equipped with a large ergonomic lever, operation requires almost no effort. The handles are lightweight and rest comfortably in your hands. It’s also easy to clean and you can hang it for convenient storage. Since it’s stainless steel, it has an attractive appearance. Pros: It’s low-maintenance, doesn’t require much manual labor to operate, and can be stored without cluttering drawers or counters. Its ease-of-use makes it especially helpful for people with conditions such as carpal tunnel and arthritis. It’s sturdy, so it lasts a long time. Left-handers report that they find it easier to use than most conventional can openers. The vast majority of customers gave this can opener five stars. Cons: This item really doesn’t come with too many drawbacks. Some customers reported that it didn’t work as effectively as promised. 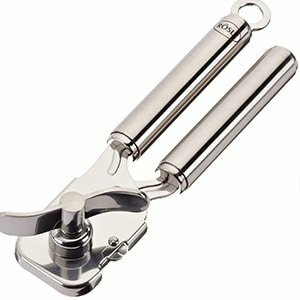 Why You’ll Love It: Last, but not least, we recommend the Kebley Stainless Steel Manual Food-Safe Can Opener for its durability and reliable performance. The heat-treated, zinc-plated cutting blade is resistant to cutting or breaking. It’s sharp enough that it can zip through cans of any size, in seconds, without leaving behind metal shavings or creating sharp edges on cans and lids. It’s designed for easy cleaning, especially since it isn’t prone to rusting. The burnished handles allow you to maintain a steady grip the whole time you’re turning the wheel. It maintains good balance on countertops while you turn the knob. Sometimes it can be difficult to line up the rim of the can to the cutting wheel, but this one latches onto cans easily. Since it’s professional-grade, you can use it anywhere- homes, restaurant kitchens, camping trips, and picnics. Pros: Durable enough to stand up to years of frequent use, it can open all types of cans, is easy on the hands, and cuts smoothly, quickly, and cleanly. As a 2-in-1 (bottle opener and can opener), it’s versatile and saves space. Compact and lightweight, it’s easy to store and use. Cons: It was difficult to find any shortcomings in this product, as the great majority of users gave it top marks. Some customers didn’t like the rubber material on the handles, but that’s probably the sharpest criticism offered about this item.